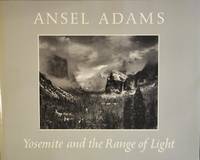 Home > Michael J. Osborne Books LLC > Yosemite and the Range Of Light. Boston: New York Graphic Society, 1979. Frontis, 28p, , plates. 31x39cm. First edition. Maroon cloth back and gray cloth covers; dust jacket. Signed by Ansel Adams on the half title page. A very fine copy in its original box. Title: Yosemite and the Range Of Light. Twelve Photographs with a Poem by Galway Kinnell.